Hagia Sophia 160 years old secret Unearthed! 160 Years Old Secret Unearthed! After 160 years of darkness, Seraphim's face is in daylight. There are 4 seraphim mosaics ( God's protector angels with 6 wings) on the 4 pendentives that carry the dome. 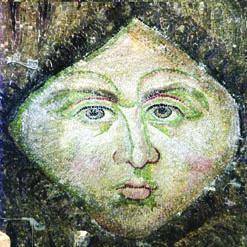 The 4 seraphims' faces were covered with 6-7 layers of plaster for almost 160 years during the sovereignty of Ottomans. The last person who saw the faces of the Seraphims was the Swiss architect Gaspare Fossati while he was holding the restoration at Hagia Sophia in 1840s. With a 10 day hard work, experts managed to take off the 7 layers of plasters and reveal the face of one of the seraphims. The 16 years old scaffold that was standing on the southeast quarter of the dome for reconstruction purposes has been unstitched to be set up to northeast quarter. The certain age of the mosaics is unclear however they are known to be older than 700 years. Hagia Sophia © Copyright by OTTI Travel. All Rights Reserved. Nothing contained on this website may be reproduced without express written permission. OTTI Travel does not assume responsibility for errors or omissions in the content of this website.